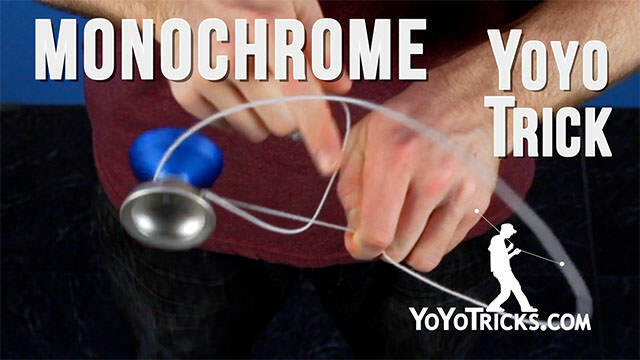 Learn how to do the 1A yoyo trick combo known as Monochrome. Now, in order to do this trick, you want to make sure you are comfortable with Kwyjibo, so if you do not already know that trick, make sure you check out our video on that. Now, to start, you are going to do a breakaway throw into an undermount. You are going to use the momentum of the undermount in order to bring the slack on top of the yoyo and create that loop that you are going to catch. 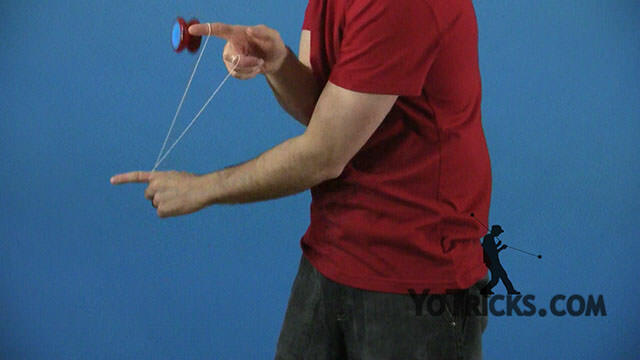 To break that down for you, what you are going to be doing is going into an undermount, and pinching the loop that is on your non throwhand index finger with your thumb, while bringing in the throwhand so that the slack forms on the outside of the yoyo and rests on top of the gap of the yoyo in front of the two strings. Then once you are in this, you are going to swing the yoyo towards your throwhand. You are going to catch that loop with your throwhand index finger in order to get into this position right here. Now, once you are in that position, you are going to take your non throwhand and take it over your throwhand. You are going to do a Kwyjibo motion where you pop the yoyo up and you are going to uncross your hands. Land on the front string. Once you are here, you are going to take the string that is on the back of your non throwhand and slide it down your wrist in order to make the next step a little bit easier. So, after that you are going to dismount the yoyo off the string while simultaneously pointing your index fingers down to move the mount in a 3D space, landing on that front string again. In order to do that, what you are going to want to do is dismount the yoyo and curl your non throwhand index finger in so that way the yoyo does not fall off. Then you are going to be taking both index fingers pointing down in towards your body, and back out so both hands are facing upwards. 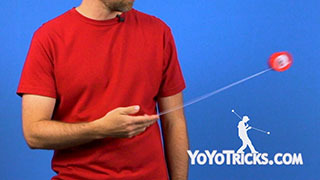 Swing the yoyo on the inside of your body back onto that front string. Then, once you are here, you will see that the string that was on my wrist is now in my palm. I can grip that with my two fingers. Then I am going to use my middle finger on my non throwhand to pinch the slack around my non throwhand index finger. I am going to drop the slack from my index finger on my throwhand. That is going to fall off. Then I am going to spin the slack over the yoyo, onto the front of it, like so. And then you can simply bind, and that is monochrome. Hey guys, my name is Cory. Thanks for learning with my today. If you want to check out some more tricks and tutorials, you can go and click over here. If you want to buy some really awesome yoyos including the one I used today, the Canon yoyo, you can go ahead and purchase that here on our website. Also you can join us on Patreon for some coupon codes and behind the scenes footage at Patreon.com/YoTricks. Thanks guys!